In an interview with The Onion, Gus Van Sant was surprised that his movie Gerry was perceived as daring. In his mind, he simply went out in the desert with a small cast and a small crew and made a movie with a shoestring budget. The constraints of budget, time, and space pushed Van Sant and his crew into a style of moviemaking that he eventually adopted wholeheartedly, one that uses long takes, sparse dialogue, and wide-open spaces. The result is a minimalist experiment in film that, depending on your tastes, is either a modest success or a resounding failure. The story is simple. 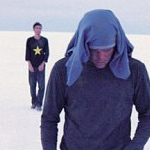 Two friends (played by Matt Damon and Casey Affleck) go for a hike. They get lost and spend the rest of the film walking, resting, talking, figuring, and walking some more. Although not directly based on a true story, it is inspired by the recollection of a true story. The title might refer to the names of the characters, but look more closely and you’ll see it’s a nickname the friends have. They use “Gerry” as a transitive verb meaning “to screw up.” For example, they got lost because they Gerried their plans. Calling each other Gerry is like a friendly punch in the arm. Gerry is full of very long takes. The camera is either stationary or else it moves with the actors to keep them in the frame. Some of these takes probably approach ten minutes. Some viewers might find this boring, but really, it’s almost unheard-of to use such long takes. It ought to be as interesting and unexpected as seeing a new movie musical. The long takes achieve different effects, depending on what’s happening in the frame. In one, the friends are walking side-by-side while the camera views them in profile, in close-up. Their heads bob up and down, sometimes synchronously, sometimes out of phase, but always with a certain rhythm. Another shot is much more stable. It begins before dawn with their figures barely visible in silhouette over an inky sky. The two friends walk away from the camera, shuffling like zombies. The camera follows them from over their shoulders, keeping up with their snail’s pace. The shot lasts long enough for the inky dark skies to turn orange and then pink. Perhaps these long takes are easier to accept because the subject matter is so well suited to them. What else are two men lost in a desert going to do? There is nothing to distract them with a new point of view every twelve seconds. Their lives are full of endless walking, endless waiting, endless resting. It’s easy to overlook everything but the film’s unconventional presentation. Nevertheless, credit should go to Van Sant and Harris Savides for outstanding cinematography, not just the technical achievement of capturing the long takes, but for the gorgeous, well-framed shots of the landscape that remind us why hikers hike in the first place. Credit should also go to Van Sant, Damon, and Affleck for the dialogue. Out of context it is unremarkable. They talk not just about how to get out of their predicament, but about Wheel of Fortune, and about a computer game they both apparently play. They don’t talk often (which feels real), so it’s interesting to hear them start a conversation from out of the blue. In the context of being lost on a hike, the banality of the dialogue is funny and inspired. The music, too, is well and sparsely used. A sad melody plays over the first shots of the two friends arriving at the trailhead. After that music is rarely used, except perhaps as a subtle gurgling, rhythmic, or ominous addition to an otherwise dry scene. Gerry is more an experiment than a fully formed movie. It’s a film made for filmmakers and cinematographers. It’s a demo reel that shows what you can do with a small budget and a portable crew. The masses may not be interested, but film afficionados should take notice. Jackie: I thought this movie was really great! The way they go on and on without talking was extremely boring and frustrating at first, but then once I realized that that is very realistic for how guys are sometimes, and then especially when they got lost. I can see many guys just thinking about their predicament and not saying much except trying to figure out what to do. I saw something completely different. Dennis: The worst movie I've ever watched..
Martin : I loved that movie, I loved everything but the killing at the end. This is so needless, so unnecessary. The only idea I have why matt was killing is friend is that director Gus Van Sant was afraid to let the movie end simple. The endless landscape , the simple story, the brilliant dialogs, the friendship of the two guy......that all is so wonderful, just amazing. If the story would have endet like as it begun.... the two friends found the highway and just sitting in a car, being back in civilisation again. That would have been great. To let Matt become an murder is ridiculous.